An hour-long tour by boat of underground Myst'ry River. Vistors travel the course of this ancient underground river, see rare blind cavefish and blind crayfish.A visit to Bluespring Caverns will bring you, first of all, to the park above the Caverns. Before or after your Caverns tour, don't miss the 1/2 mile nature trail in our Bolton Natural Area. It's your chance to veiw one of Indiana's largest sinkholes (covering over 15 acres!) 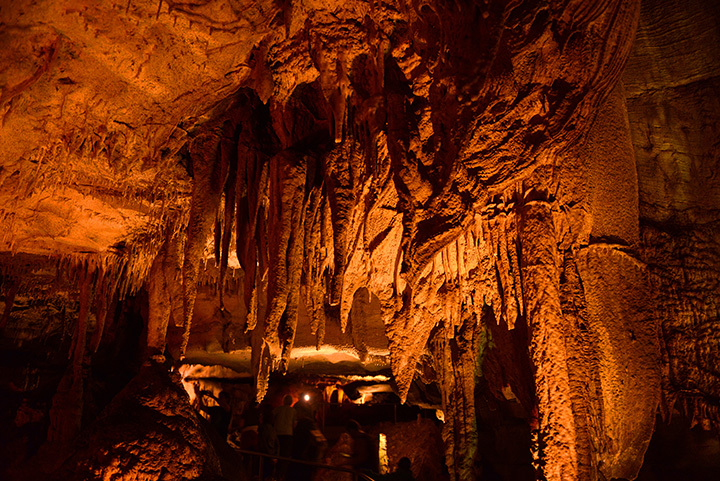 as you experience the connection of the land above to the great Caverns hidden below. At the Colglazier Visitor Center you will find a varied selection of unique gifts and souvenirs and also the opportunity to prospect for your own semi-precious gems at the "Myst'ry River Cemstone Mine". Other Park facilities include free parking, picnic areas and shelter, and clean, spacious restrooms.